This year, as (a very warm winter for North Texas) came to a close-I started going through my freezer. I like to stock up b/c if there is a snowflake anywhere within a 15 mile radius we shut the city down, right after we buy every loaf of bread at the grocery stores within a 20 mile radius. So, each fall....I stock my freezer for all both days I might be snowed in....it hasn't happened in several years, but it happened once-five snow days in a row-once in 37 years. So, to make a short story long, one thing I had in the freezer were some taquitos from Costco. Several years ago a friend introduced me to this variation on enchiladas. 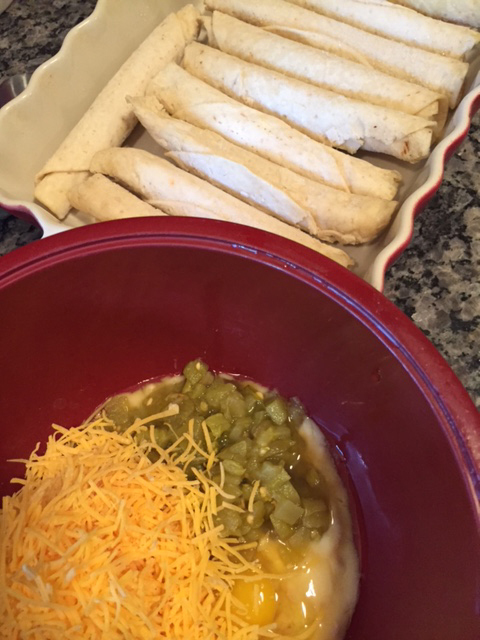 You lay your taquitos out while they are still frozen in a 9x13 baking dish. Mix 1 can (10 oz) of cream of chicken soup, 1 can (about 1/3 c.) of green chilies (drained), 1 c. of cheese, and 1 egg. Mix and spoon it over the frozen taquitos. 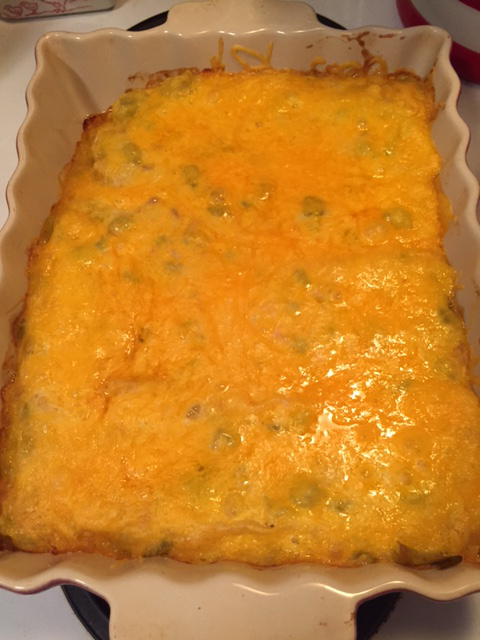 Top with 1 c. of cheese. Bake uncovered at 350 for 50 minutes. You can serve them with aside of sour cream or guacamole, but....man are these good. 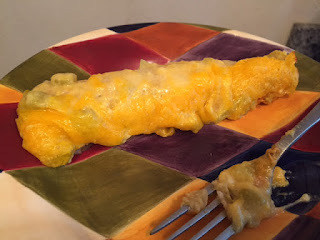 If you have small taquitos you can make several layers and divide the mix between the layers. ..and now there is room in my freezer for next winter!